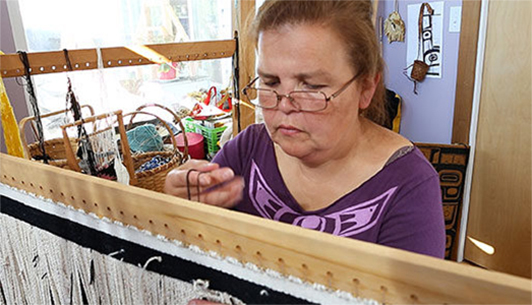 Master weaver ‘Nalaga, Donna Cranmer is from the ‘Namgis band of the Kwakwaka’wakw Nation from Alert Bay, British Columbia. Donna’s Kwak’wala name is Nalaga, which means Daylight Woman. She has been weaving with cedar bark for over 25 years and Chilkat weave for 16 years. She creates traditional and contemporary pieces. 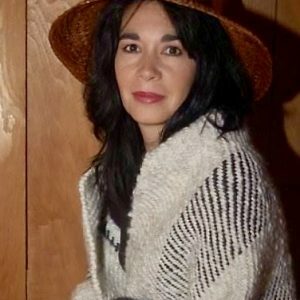 Donna’s great, great, great grandmother Mary Ebbetts-Hunt was a Tlingit woman from Tongass Island, Alaska who was a Chilkat weaver. Donna’s direct family lineage gives her the right to weave Chilkat and to dance these beautiful pieces in potlatches today. Her great granny Axu – Agnes Alfred’s baskets were her first teacher. 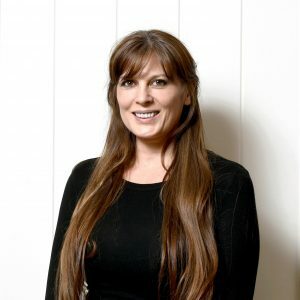 Donna has visited museum collections in North America and Britain to gain knowledge from the cedar and Chilkat pieces. Donna works with cedar bark making traditional regalia used in Kwakwaka’wakw ceremonies and weaves Chilkat which is a tradition that originates with the Tsimshian of Northern BC. In recent years Donna has also created contemporary cedar pieces, ie. cedar bark bikini using the material to create non-traditional pieces. I feel a sense of pride creating pieces that our ancestors created to carry on the traditions which the creator gave to us. The regalia I make is used in our traditional bighouse (ceremonial house) by our dancers. Our regalia is not only what we wear to do our dances, it is medicine. Our art is more than just something beautiful to look at, it helps us feel whole.